Encourage. Inspire. Motivate. These are some of the most important things we can do for someone and it costs us nothing. So why don’t “we” do it more?!? We lose nothing by lifting another. Encourage one another, and build each other up (1Thes5:11). Today, make it your mission to inspire, encourage, support, motivate…someone else. You never know who really needs it so sprinkle it around like glitter!!! Light someone else’s candle! As a mentor, in whatever your capacity may be, whether you are a parent or other family member, older sibling, community leader, celebrity, entrepreneur or stranger, it has to be our duty to teach, inspire and motivate the next generation and those around us. What better way to leave a legacy. You can’t be afraid that it may be your downfall. There is power in inspiration. Simply telling your story can help someone, you never know. And how important is that, to make others feel that they can do whatever they put their minds to. 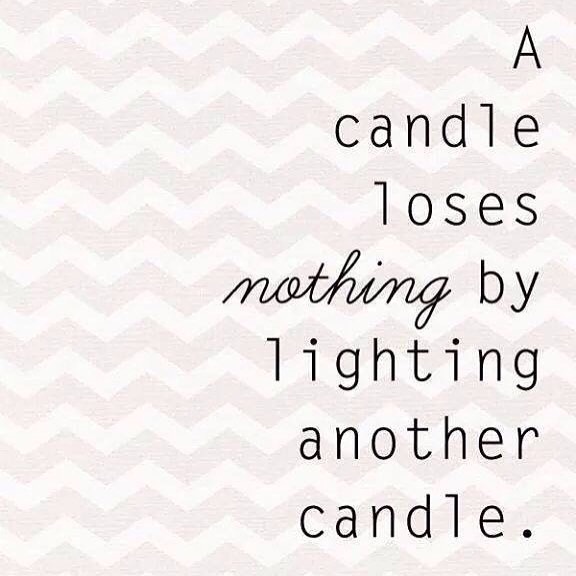 Let’s not only “light” that candle for others, which takes nothing but your time, but let’s also lend a helping hand. A little effort to motivate and inspire someone goes a long way and won’t hurt either. 🙂 You lose nothing in the process but could gain a smile, friend and follower.